It was only yesterday that you met up with your friends at the tavern in town for drinks and spent the latter part of the evening poring over an old treasure map that you’d found. Maybe it was the ale or maybe it was bad judgment, but when someone suggested that you join up and go in search of the treasure, it seemed like a really good idea. And so it was that the very next day you and your companions set out on the road in search of fame and riches. What you got instead was a slaughter. Those ruins weren’t as abandoned as the old map had led you to believe. The sight of your friends being ripped limb from limb and eaten alive are not visions you are ever likely to forget. It was only by some miracle that you survived at all. And now that you’re the only one left, the only thing on your mind is revenge. Of course, picking up a few valuables along the way isn’t out of the question. 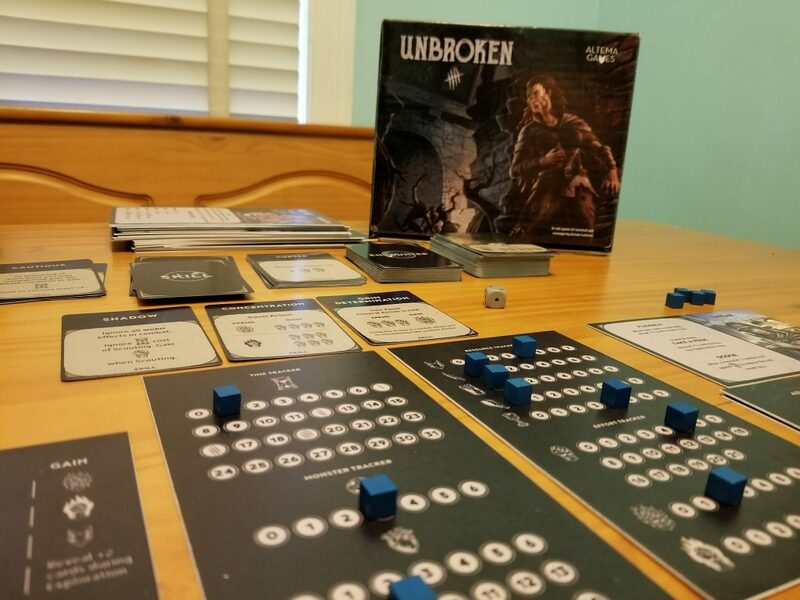 Unbroken, designed by Artem Safarov, is a solitaire game about survival and revenge. Your avatar, having survived a terrible catastrophe, will use their abilities to gather resources to craft weapons, use their wits to outsmart and trick their enemies, and hone their skills to face down and hopefully defeat the evil beasts that overwhelmed and defeated their party. You begin with a small chunk of time and will use this time to gather intel about your enemies, search your surroundings for food and other useful items, and to prepare yourself for the challenges that lie ahead. As you delve deeper into the dungeon, your skills will sharpen and the monsters that you encounter will become more powerful. Will you fight your way through or will you use your wits to outsmart and bypass them entirely? The choice is yours. If you’d like to get a sense of how the game is played, then continue reading. If you’re just interested in what we thought about the game, then feel free to scroll on down to the Thoughts section. 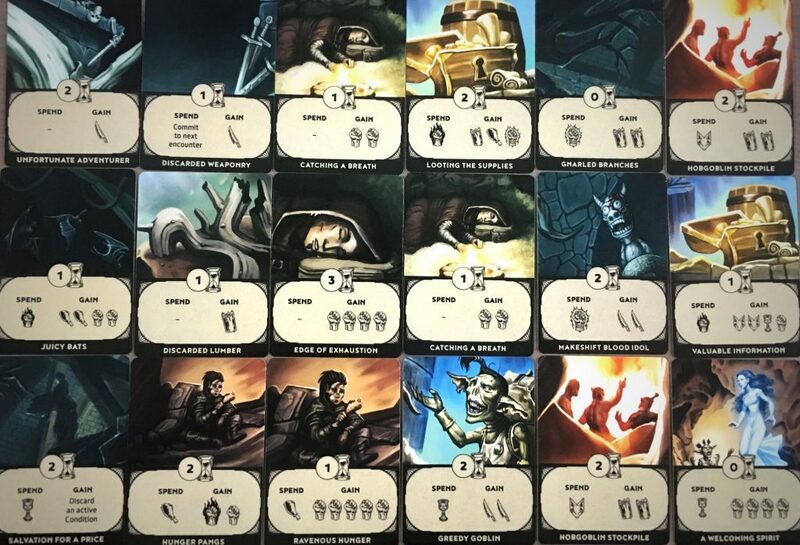 Unbroken contains several display sheets that are used to track the usage of time, the exertion of effort, gains and losses of items, monster health, etc. There are also several character sheets which display a specific class that has its own unique abilities as well as sheets that contain monsters that provide information such as the monster’s abilities, its weaknesses, and rewards for defeating it. 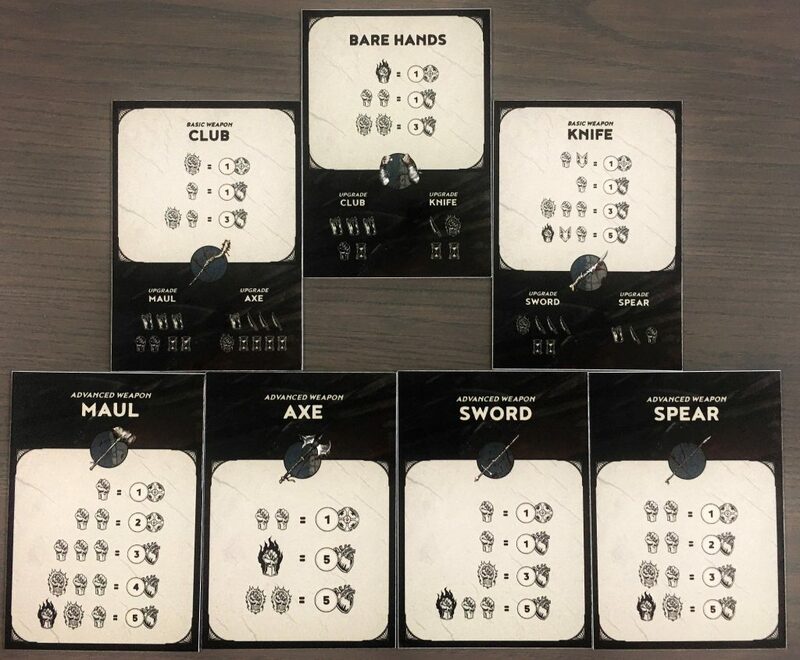 Also included are several decks of cards – skill cards, encounter cards, and condition cards – and some sheets showing the different weapons, the costs to craft the weapons, and the weapon’s stats. There’s also a single six-sided die included and some small wooden cubes. While I cannot speak to the overall quality of the finished product (since this is just a prototype), I can say that the quality of the prototype that I was provided is outstanding. The cards are nice and crisp and the sheets are very thick and sturdy. Great care was taken in putting this together. Hopefully this is an indication of what you can expect from the final product. The setup for Unbroken is pretty simple. First, all of the monster sheets are arranged in stacks by the Roman numerals on their backs and placed face down close by. Then the weapon sheets are arranged in a stack with the “Bare Hands” on top. Then the other sheets are set down and seeded with the wooden cubes at their starting positions. The different decks of cards are shuffled and placed face down except for the condition cards. These are placed face up and do not need to be shuffled. Once this is done, you can choose a character sheet at random or pick your favorite one and you’re ready to begin playing. The game is played over four rounds which are broken into two phases – the travel phase and the combat phase. During the travel phase, you will begin with a certain amount of time and a certain amount of effort. Most of the things you will choose to do in this phase will cost you time and many of the actions you can perform will also cost you effort. The travel phase is broken down into several steps – preparation, exploration, and decision. During the preparation step, you may perform any non-combat actions. These actions include such things as scouting ahead to find out more about the monster that you will be facing during the combat step, using effort to gain cunning, or turning your small effort into medium or large effort. Different actions might cost you a different amount of small effort, large effort, and cunning so it helps to have some of these things on hand. During the decision step, you must decide whether or not you’re ready to fight the monster. If you are, then you go directly into the combat phase. If you’re not, you’ll go exploring. 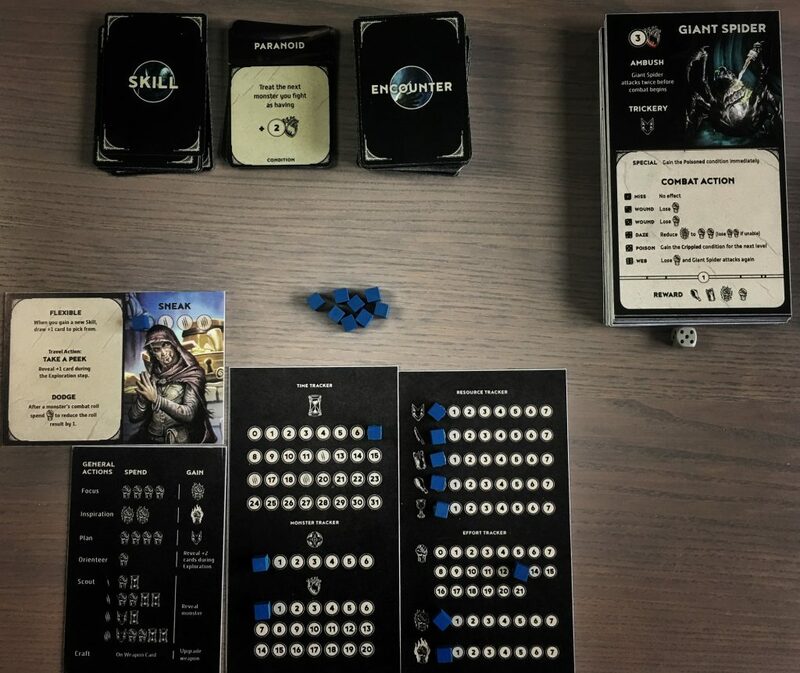 To go exploring, you’ll flip over a number of cards from the deck of encounter cards. You’ll keep one and discard the rest. 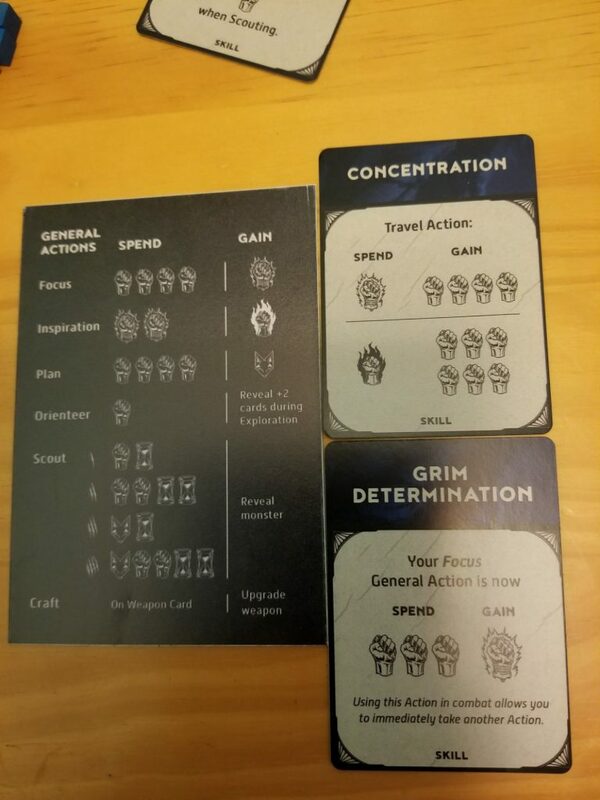 Then you can either perform the action on the card (paying the associated resource costs) or you can rest and gain an amount of effort equal to the time cost shown on the card. Then you must pay the time cost shown on the card. If this causes you to run out of time, you must begin the combat phase and the monster gets to ambush you. If you didn’t run out of time, you go back to the start of the travel phase and repeat all of the steps. The combat phase is broken into several steps – ambush, trickery, and battle. If you ran out of time during the travel phase, you will get ambushed and whatever the monster’s ambush ability is will be applied to you. Then you get to decide whether to face the monster in battle or to bypass the monster entirely using your wits. Most of the monsters on the first through third levels have a trickery cost associated with them. Be aware that if you trick a monster, you won’t get any of the rewards for defeating it. 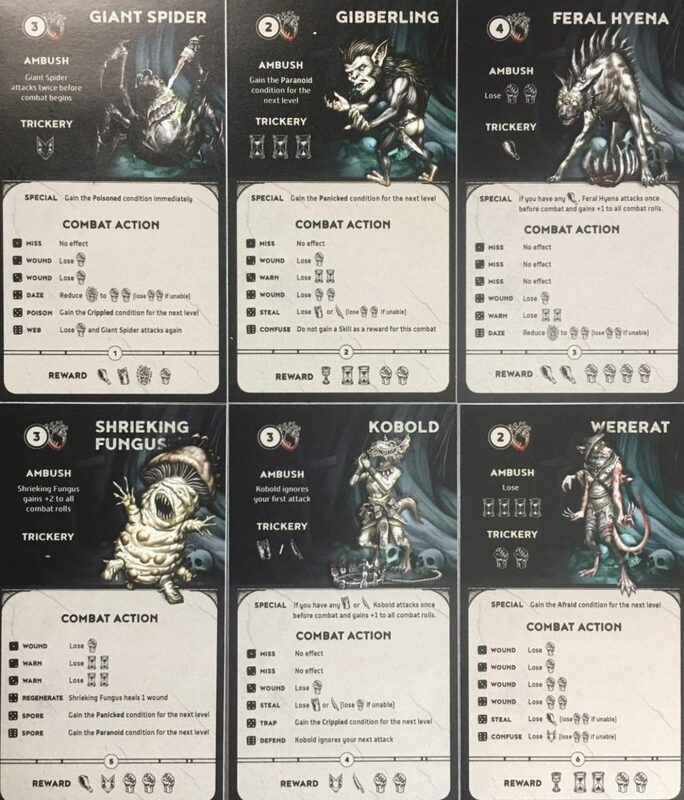 At the top of each monster card is a health icon (and possibly an armor icon) with a number next to it. These represent the monster’s total health (and armor, if applicable). This is what you must overcome in order to defeat the monster. Before the monster can take damage, any armor that the monster has must be broken first. The cost to deal damage and break armor depends entirely upon whichever weapon you are using at the time. Using just your bare hands, you cannot break armor and it will cost a lot more effort to land a blow than it will if you were to use a knife or a sword. Once you’ve had a chance to land a blow, if you did not outright defeat the monster, then the monster attacks back. The six-sided die is rolled and compared to the chart on the monster sheet to determine what, if anything, happens to you. If you manage to pull out a win, then you reap the rewards shown on the monster sheet. However, if you run out of effort, you lose immediately. After combat, you must eat an amount of food equal to the level that you’re currently on. If you can’t come up with enough food, then you die of starvation and your game is over. If you make it all the way to the end of the fourth level and defeat the boss, then you win. The artwork in this game is awesome. The dark, monochromatic color scheme evokes a real sense of despair and hopelessness. While these are not generally things you want to feel when you’re playing board games, it works very well here. The visual aesthetic really helps to draw you into the narrative. I like it quite a lot. What I’m not fond of is the game play itself. There are a few things about Unbroken that really trouble me. It begins with the background story. If I were to place myself in a situation wherein I had to watch all of my companions be murdered right before my eyes and I was accidentally spared, I don’t think the first thing that I would choose to do would be to wade into battle with my last little bit of energy. Nope. I’m pretty certain that my first course of action would be to get out of there and run as far away as possible followed by my second course of action, which would be to thank my lucky stars that I was still alive. Maybe that’s where my initial dislike comes from. Even with the evocative artwork, I can’t buy into the narrative, so I can’t enjoy the game. Or maybe it comes from the game play itself. Out of ten playthroughs of Unbroken, I have only won a single one and that is only because I accidentally stumbled across a skill card combination that essentially worked to provide me with an infinite amount of effort. Looking into it, I discovered that some other people had reported stumbling across the same thing and that this was completely unintended and wouldn’t make it into the final product. Every other time I have played the game, I consistently meet my maker fairly early on. At first I thought that maybe I was just terrible at the game, so I started notating my decisions so that I could rewind time and try a different tact and the outcome was always the same. There’s just way too much randomness involved for any decisions that I make to be of any real consequence. Ultimately, being at the mercy of random card flips and random dice rolls makes me feel like the game is playing me instead of the other way around and the overall experience becomes intolerable and unenjoyable. Furthermore, it bothers me that I am forced to continue delving deeper. It just doesn’t make any sense to me why my character would choose to push on when they are doing poorly and their demise is inevitable. If I were allowed to remove myself from the dungeon at any time and tally up my points based on the progress that I had actually made, then I might like the game better. But that option doesn’t exist. Or maybe I might enjoy Unbroken more if I got to begin the game with a Skill card. After all, it doesn’t seem very logical that my avatar wouldn’t have any life skills at all to call on. But, I can’t begin with a Skill card and, as a consequence of this and the other aforementioned issues, I’m not a fan. Then again, I am not a solitaire gamer by nature. I am not Unbroken’s targeted demographic. Maybe that’s why I didn’t enjoy the game. So, to make sure the game gets a fair shake, I handed it off to one of our writers who IS a solo gamer. I’ll let her tell you how she feels about Unbroken. Take it away, Wendy. As a primarily solo gamer, this game has appealed to me from its initial print and play beginnings. One of my favorite themes in games is the dungeon delver, making this another check on my tally sheet. I have read some reports of gamers not liking the revenge aspect of the game. I can see their point. However, I can really get behind it. We have all seen, and rooted for, heroes in movies who come upon unspeakable horror and immediately seek revenge for their fallen comrades. In this game, it’s the motivation that drives you deeper and deeper into the monster’s lair. When the last blow is delivered, then you may rest, recover, and take a moment to reflect upon what happened. Until then, that need for vengeance drives you further. The game play was something that I really enjoyed. During the travel phase that begins each round, you scour for food, resources, and even rest. For me, all of these actions fit the theme perfectly. Walking through a dungeon, an adventurer would most certainly find random items, making the randomness of the encounter deck all the more thematic for me. 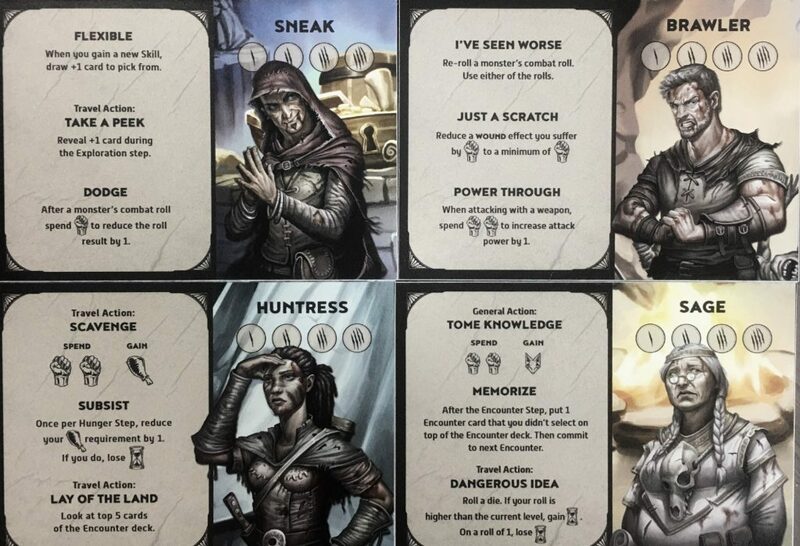 The text on the cards is flavorful, helping to draw you into the game even further. Take too much time trying to prepare and the monster may get the drop on you! Collect the right resources and you may get the drop on him. The monster battles can be tough, but they were designed to be. The dice rolls are random, like a real battle would be. I like not knowing what is coming at me next. What will the monster throw at me? What can possibly happen next? Roll the die to find out. I like the challenge, and with every loss I have learned something. I have learned what resources to focus on and what resources I can do without. This game is also a journey about myself as a player. Am I the cautious type or am I the type to rush right in and let the pieces fall where they may? I love the discovery. 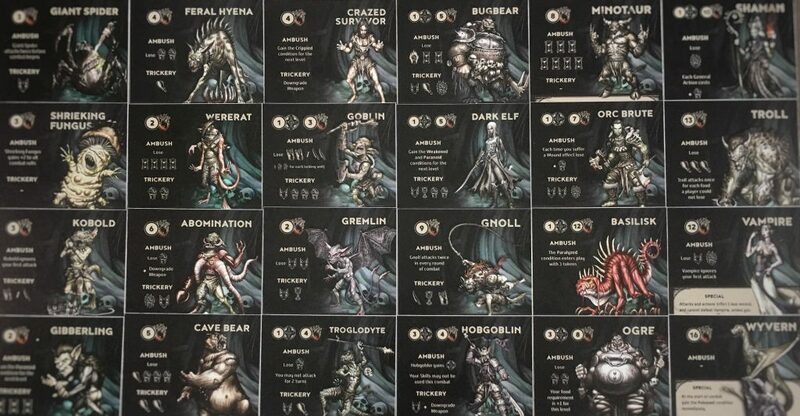 Right out of the box the game comes with 4 different heroes to choose from and 20 different monsters to fight giving Unbroken a high replayability. This game was a win for me, and I am very excited to see the final product. As a solo gamer, it ticks almost all of my boxes and I can’t wait to add it to my collection permanently. Wendy, just curious how many times you’ve played Unbroken and how many of those times you have won? I have played this too many times to count, I’ve had the PnP almost since Artem first released it. If I had to venture a guess I’d say I win about 30-35% of the time.